I grew up playing collectible card games (CCGs). I started out playing Magic: The Gathering just as the “Tempest” expansion was being released. Before long, I moved into the Star Wars CCG, made a short pitstop at Pokemon, and finally settled on WWF WWE Raw Deal before getting out of the CCG field completely. It wasn’t because of a lack of desire, but because of a lack of money. Buying booster packs is expensive, and outside a few awesome pulls and sales on eBay, it costs a fortune to stay competitive. So I quit. I stayed CCG-sober until last year when Blizzard released Hearthstone, a World of Warcraft-themed online card game with everything I had been looking for in a CCG. It was online, casual, fun, and–most importantly–cheap. I got a beta invite, and ever since then, I’ve been Hearthstoned out of my mind. Like everyone else, I started out playing a Mage. Unlike a lot of folks, I loved the class. 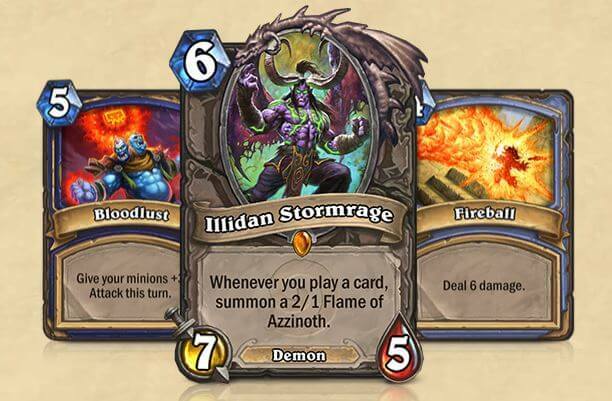 I love the direct-damage spells and the control-oriented playstyle. I made a cheap deck made out of whatever cards I could get by opening booster packs using in-game Gold I earned from winning matches. After a few rough patches, I just kept on winning. By the end of my first ranked season in Hearthstone (and every month is a season), my Mage and I were rank 12 (out of 25, counting down). The next month, I think I was around rank 14. I kept winning sporadically, completing the daily quests (usually playing/killing a certain number of creatures or winning X games with Y or Z class), and making my deck better, little by little. It was fun, but the newness eventually wore off, and I took a few months off, only logging on long enough to get the new, monthly card back reward from reaching Rank 20 in the monthly ladder. When I came back to the game, there was a real expansion released, and I decided I wanted to play a new class–the Paladin–because of some of the new cards I’d seen leaked early on. This is when I started spending actual money on the game. It’s also when I realized that it wasn’t actually worth spending money on the game. See, in normal CCGs, you can only get new cards by shelling out cash for booster packs–or trading with your friends. But there is no mechanic IRL for getting cards from the game company for simply playing the game. There is in Hearthstone, though. In the entire life of the game, I’ve probably spent 40 bucks total. A few dollars for a pack here an arena entry there. And you know what? I probably shouldn’t have. I didn’t actually get that much in return for my cash. I don’t regret spending the money, but I realized that I was literally paying to save myself from grinding out gold to get more booster packs. Sure, I was able to get some good cards and make a pretty competitive Paladin deck that’s keeping me in the mid/low teens each season, but I could have made the exact same deck simply by playing more games. It just would have been a lot slower. So that’s your tradeoff. You don’t have to spend money in Hearthstone to be get more powerful cards from booster packs, and even the most basic cards can be competitive in the hands of the right player, but it’s going to be pretty slow going if you don’t spend anything. It is entirely possible to never spend a cent on Hearthstone if you don’t want to. That’s probably the best thing about the game–it’s still totally fun to play even if you don’t spend any money on it. It’s just a good game that’s fun to play. Those are harder to find than you’d think. One of the things that keeps me from gaming a lot is not feeling like I’m spending my time well. I don’t raid on MMOs anymore because I can’t justify 10-20 scheduled hours a week playing a game. That’s a part time job, and I’m unfortunately too busy for that. Luckily, Hearthstone is super casual. I can play it on my iPad, laptop, or desktop. (Heaven help me when there’s an iPhone version of it later this year.) Games don’t take more than 10-15 minutes at a time, and because I can hop on at any point and play, I get a lot of playtime while I’m on my FitDesk. I tend to spend time on the FitDesk every morning. I’m usually writing on one of my books, this blog, or playing some kind of game while I’m getting a couple hours of exercise in before work. I love Hearthstone because whenever my brainyparts are farting out and just not working right, I can always grab a deck and slay a few dragons (or spiders or kobolds or whatever) before getting back to work. I mean, I’m always saying that fitness should be fun and that you won’t stick with any kind of exercise that you don’t legitimately enjoy. So between Hearthstone and the FitDesk, I don’t think I’m going to have a problem with that for a long, long time. And when warm weather comes back and I can run outside again? I may just die of superhappyfuntime. So do you guys play Hearthstone? My tag is Lesser#1993, if you do. I have no idea at all what this is but my teenage son is obsessed with Madden and Call of duty. I don’t get it! Have fun! And I can’t get into either of those. I tried, but the online communities in them tend to be way more negative than I want to be a part of. Glad he has fun, though! Ok. My geekiness draws the line at CCG. Can you explain Pokemon???? My 6 year old is obsessed! All I know is that I spend a lot of time helping him sort and alphabetize cards in a binder and making sure his Pikachu is safe. I wish I could! I have friends who still adore Pokemon, but I haven’t played in years. It’s mainly about collecting the critters and making sure you have the best team for battles. It’s all very strategic and I don’t get it at all anymore.